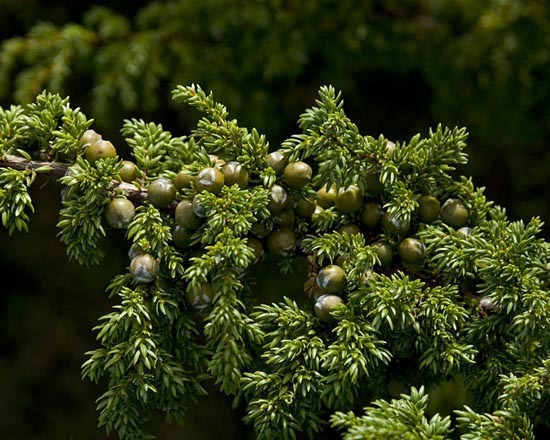 The only species of Juniperus occurring in the Azores where it is endemic and threatened by competition from invasive alien species and by the expansion of agricultural land. A dioecious, erect or spreading shrub or small tree attaining a height of upto 6m. Branches spreading or ascending and forming an irregular crown. Typically the bark on old-growth trees exfoliates into long thin flakes which are reddish to grey-brown in colour. Very dense, leaves borne in alternating whorls of 3–10 x 0.1–0.3cm, boat-shaped, strongly curved, margins entire, apex obtuse or acutely pungent, with two white stomal bands on the upper surface. Female seed-cones 7–9mm, globose, dark copper-brown when mature after two years and ripening in the autumn. Seeds 3 per cone, ovoid and triquetrous. Male pollen-cones are borne solitary in the axils of the leaves, 3–5 x 2–4mm, orange-brown in colour and shedding pollen in the spring. A very distinctive species which can easily be identified due to its very dense, stiff foliage and short needles. Occurs on all the islands with the exception of Graciosa and has an area of occupancy (AOO) of 513km². The area of occupancy (AOO) is distributed throughout the islands as follows (the percentage given is the AOO relative to the total area of each island): Corvo: 6km² (35%); Faial: 28km² (16%); Flores: 87km² (61%); Pico: 174km² (39%); São Jorge: 64km² (27%); São Miguel: 35km² (5%); Santa Maria: 1km² (1%) and Terceira: 118km² (29%). São Miguel has two locations; Lagoa do Fogo and Tronqueira/Graminhai. 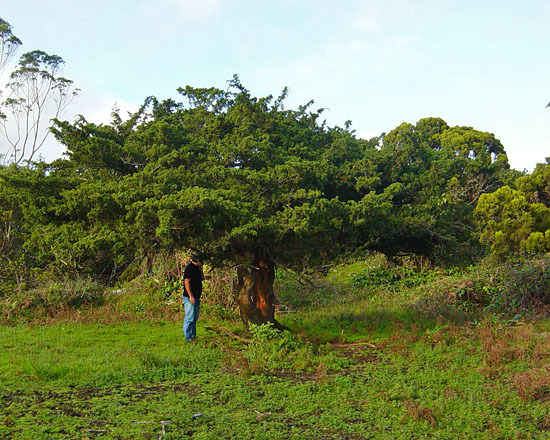 On Terceira the Juniper occurs throughout the central part of the island, with one coastal location at Agualva. On Pico it also occurs throughout the central part of the island with two coastal locations of Manhenha and Cais-do-Mourato2. On Santa Maria it only has one location at Almagreir. Juniperus brevifolia occurs in a range of different habitats; coastal scrubland with Myrica faya and Erica azorica; mountain scrubland with Calluna vulgaris; pioneer scrubland on lava flows with Erica azorica, Calluna vulgaris and Vaccinium cylindraceum; Juniperus-Laurus azorica forest; Juniperus–Ilex azorica forest; as pure Juniperus woods and Juniperus–Sphagnum woods or Juniperus forested peat bogs3. Most of the volcanic islands consist of alkaline basalt and typically are subject to daily cloud to 700m or below. Depending on latitude and altitude the annual rainfall varies between 700–1600mm. This species is now too rare to be exploited: in the past its timber was used for construction. 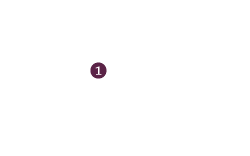 The area of occupancy has been calculated to be 513km² which falls well within the 2000km² threshold for Vulnerable under Criterion B. The population is severely fragmented with a continuing decline in both its area of occupancy and quality of its habitat. Detailed field studies undertaken throughout the Azores since it was last assessed in 1998 as EN B1+2c indicate that it is more widespread than previously thought. The expansion of agricultural land and the impact of livestock as well as forestry, especially the establishment of Cryptomeria japonica and Eucalyptus globulus plantations. 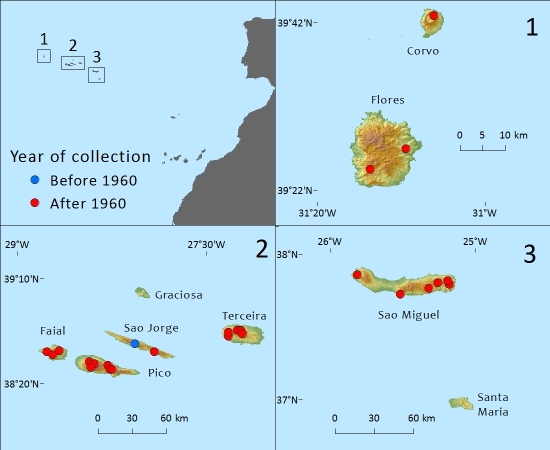 These activities have caused a great decline of the subpopulations on the islands of Pico, Terceira, São Jorge and Flores, especially in mountainous areas above 500m. The greatest threat is from competition from alien species, especially Pittosporum undulatum at lower altitudes, Hedychium gardnerianum at higher altitudes and, in São Miguel, Clethra arborea. Over the past ten years there has been a decline of about 10 % of the overall population but the situation varies from island to island. Flores: (i) Reserva Florestal Natural Parcial do Morro Alto e Pico da Sé; (ii) Zona Especial de Conservação da Zona Central Morro Alto (Rede NATURA 2000); (iii) Reserva da Biosfera. Covo: (i) Parque Natural da ilha do Corvo: Área Protegida para a Gestão de Habitats e Espécies da Costa e Caldeirão. São Miguel: (i) Parque Natural da ilha de São Miguel: Reserva Natural da Lagoa da Fogo; (ii) Parque Natural da ilha de São Miguel: Reserva Natural do Pico da Vara; (iii) Parque Natural da ilha de São Miguel: Área Protegida para a Gestão de Habitats e Espécies da Tronqueira e Planalto dos Graminhais; (iv) Parque Natural da ilha de São Miguel: Área Protegida para a Gestão de Habitats e Espécies da Serra de Água-de-Pau. Terceira: (i) Reserva Florestal Natural Parcial da Serra de Santa Bárbara e dos Mistério Negros; (ii) Reserva Florestal Natural Parcial Biscoito de Ferraria; (iii) Zona Especial de Conservação da Serra de Santa Bárbara e Pico Alto (Rede NATURA 2000); (iv) Zona Especial de Conservação das Quatro Ribeiras (Rede NATURA 2000). São Jorge: (i) Reserva Florestal Natural Parcial do Picos do Carvão e da Esperança; (ii) Reserva Florestal Natural Parcial do Pico do Areeiro; (iii) Zona Especial de Conservação Costa Nordeste e Ponta do Topo (Rede NATURA 2000). Pico: (i) Parque Natural da ilha do Pico: Reserva Natural da Montanha do Pico; (ii) Parque Natural da ilha do Pico: Reserva Natural do Mistério da Praínha; (iii) Parque Natural da ilha do Pico: Reserva Natural do Caveiro; (iv) Parque Natural da ilha do Pico: Paisagem Protegida da Cultura da Vinha – Ponta da Ilha; (v) Parque Natural da ilha do Pico: Paisagem Protegida da Cultura da Vinha – Zona Norte; (vi) Parque Natural da ilha do Pico: Paisagem Protegida da Zona Central. Proposed practical conservation actions include the maintenance and restoration of the habitat, reinforcement of populations and regional recovery plans. The establishment of corridors, controlling invasive species and access to sensitive areas are also considered important to put in place. Elias, R .B. (2007). 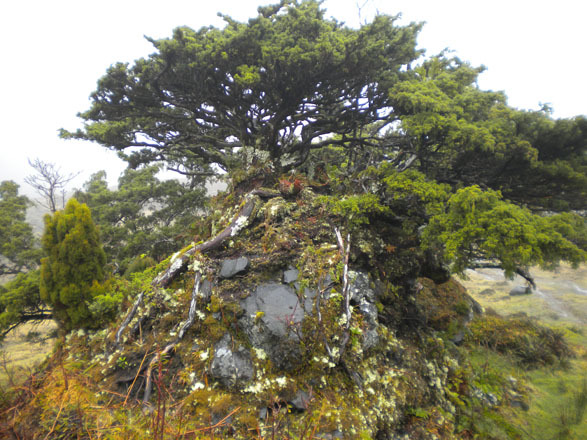 Ecologia das florestas de Juniperus dos Açores. Universidade dos Açores. PhD thesis. Dias,E., Elias R. B. & V. Nunes. (2004). 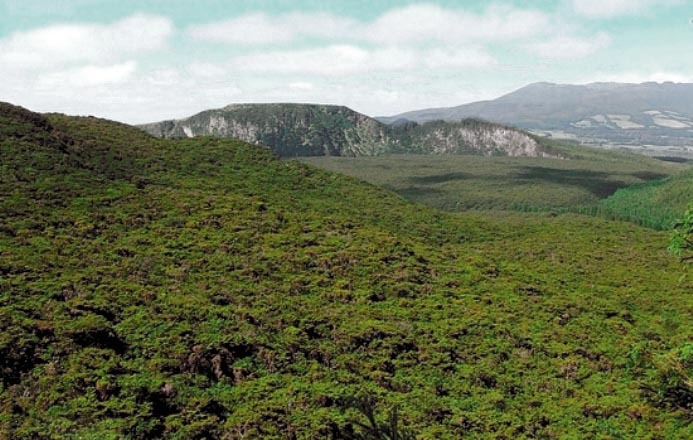 Vegetation mapping and nature conservation: a case study in Terceira Island (Azores). Biodiversity and Conservation 13: 1519–1539. Farjon, A. & C. N.Page (comp.). (1999). Conifers. Status survey and conservation action plan. IUCN/SSC Conifer Specialist Group. Gland, Switzerland and Cambridge. IUCN. 121. Elias, R. B. & E. Dias. (2009). Gap dynamics and regeneration strategies in Juniperus-Laurus forests of the Azores Islands. Plant Ecology 200(2): 179-189. Elias, R.B., V. Martins. (2006). 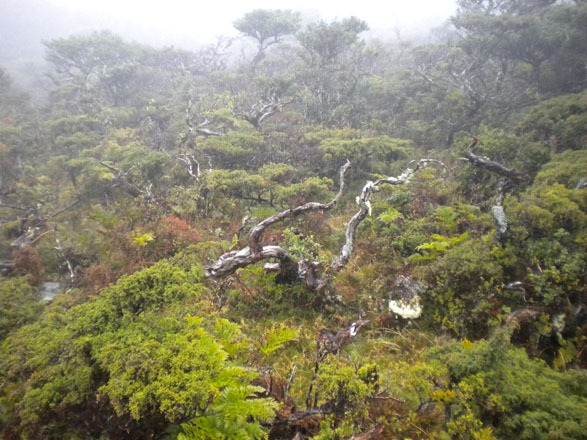 Anthropogenic succession on Juniperus brevifolia forests in Terceira Island (Azores). Proceedings of the 5th international symposium on the fauna and flora of Atlantic Islands. Occasional Publication of the Irish Biogeographical Society. 9: 111–120. Elias, R. B.& E. Dias. (2009). Effects of landslides on the mountain vegetation of Flores Island, Azores. Journal of Vegetation Science. 20: 706–717. Silva, L., Elias, R. B., Moura, M., Meimberg, H. & Dias, E. (2011). Genetic variability and differentiation among populations of the Azorean endemic gymnosperm Juniperus brevifolia: Baseline information for a conservation and restoration perspective. Biochemical Genetics. 49: 715-734. Thomas, P. 2011. Juniperus brevifolia. In: IUCN 2012. IUCN Red List of Threatened Species. Version 2012.2. Downloaded on 07 March 2013. R.B.Elias,S.Herrington,and M.F.Gardner, 2015. Juniperus brevifolia, from the website, Threatened Conifers of The World (http://threatenedconifers.rbge.org.uk/taxa/details/70).